Dressed in a baby pink tee and blue shorts, Disha Patani was all about the perfect abs that we all dream of in this picture. Disha Patani, who is currently basking in the success of her last release Baaghi 2 starring Tiger Shroff, is trending today for all the right reasons. The gorgeous actress is a fitness freak and, is often clicked outside her gym. Disha also loves dancing and considers it an important component of her fitness routine. Recently, the uber fit actress flaunted her super-toned abs in one of the pictures shared by a fan club. Needless to say, the photo went viral in a jiffy. Dressed in a baby pink tee and blue shorts, Disha Patani was all about the perfect abs that we all dream of in this picture. Check it out right here. The actress is surely giving us serious fitness goals! Disha is often spotted with her gym partner in varied parts of Mumbai city. Right from shopping to dining, the actress loves to hang out with her gym partner. 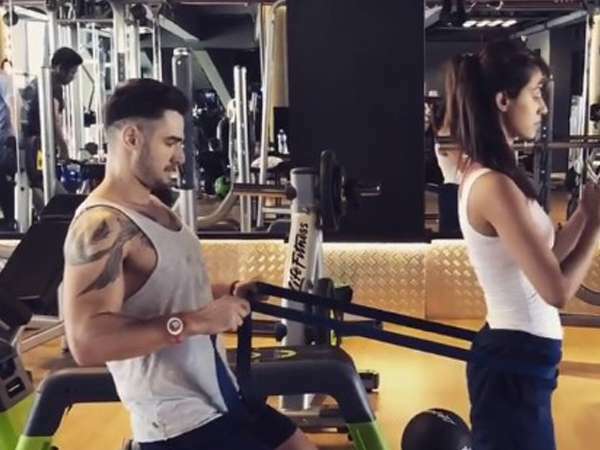 In the past, Disha Patani was seen grooving to the tunes of ‘Shape of You’ with celebrity dance trainer Harsh Vardhan Khemka taking the internet by storm. The actress who featured with Jackie Chan in Kung Fu Yoga also learnt a new dance form while shooting for the movie in China called ‘Square Dancing’, a form of exercise routine where you are supposed to perform to music at squares, plazas or parks across cities. The actress grew very fond of the routine and said it has a calming effect on her mind, apart from the fitness benefits. Adding that since her fitness regime is very hectic, the dance routine brings in all the fun.